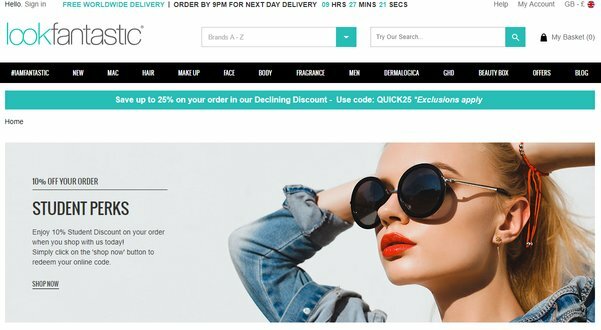 Look Fantastic Student Discount Code – 25% Off! Currently there is a Look Fantastic student discount code to get 25% off everything. It’s listed on this page on lookfantastic.com. Just head over there, pop it in at the check-out and you’ll get a nice reduction on your cosmetics and make-up purchases. The best thing is no student id is required making it super easy! 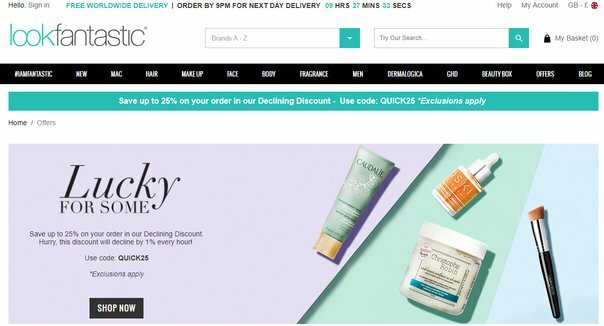 Look Fantastic is an amazing one stop online shop for all your make-up, cosmetics, skincare and fragrances. They have all the big brands including Clinique, Elizabeth Arden, REN and Redken to name a few plus some excellent new names entering the sector. We love the choice on offer, easy delivery options and the prices are always competitive. Plus there is a standard Look Fantastic student discount but also usually promo codes and offers to save even more. Check out our fantastic savings section which is regularly updated. FeelUnique are big online rivals and have a standard beauty student discount. For a couple of the high-street beauty retailers, Boots doesn’t have reductions for students but often their discounts can save you more. Superdrug does have a handy student discount and highly competitive prices. Debenhams while not having a student code regularly has excellent price reductions, especially if there is a Blue Cross sale. House of Fraser has a superb 10% student discount code plus additional offers where you can save more.